Native of Asia but widely planted and spreading from cultivation into vacant lots, sidewalk crevices, disturbed ground, shores, and forests. Evidently becoming quite aggressive in recent years. First collected in 1963 in Isabella Co., though surely established well before then. This is a rapidly growing tree, often small and bushy as an escape but capable of growing to a large size. 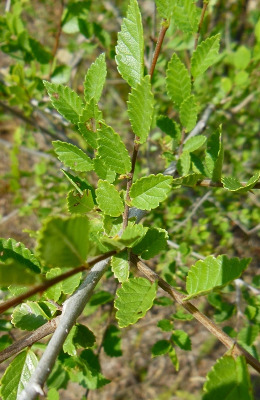 Sometimes called “Chinese Elm,” but that name is best applied to U. parvifolia Jacq., which flowers and fruits in late summer or fall and has leaves of vigorous shoots with the apex (and teeth) less sharply acute than U. pumila. Occasional plants observed (but not collected) in disturbed sites Washtenaw and Wayne Cos. have the habit of U. pumila, but much larger and strongly scabrous leaves and are probably hybrids with U. rubra. See Zalapa, Brunet, & Guries (2009) for information on this hybrid. MICHIGAN FLORA ONLINE. A. A. Reznicek, E. G. Voss, & B. S. Walters. February 2011. University of Michigan. Web. April 21, 2019. https://michiganflora.net/species.aspx?id=2750.